Well, this mailbag is loaded. The Hail Varsity staff builds some 7-on-7 teams and answers questions about Jim Harbaugh, baseball, basketball and JUCO guys. Direct any hate towards Jacob Padilla. Brandon Vogel, Greg Smith and Derek Peterson all got their answers in before him this week. If you have questions for next week's mailbag, send them to derek@hailvarsity.com or tweet them at Hail Varsity's main Twitter account or Derek's Twitter account. 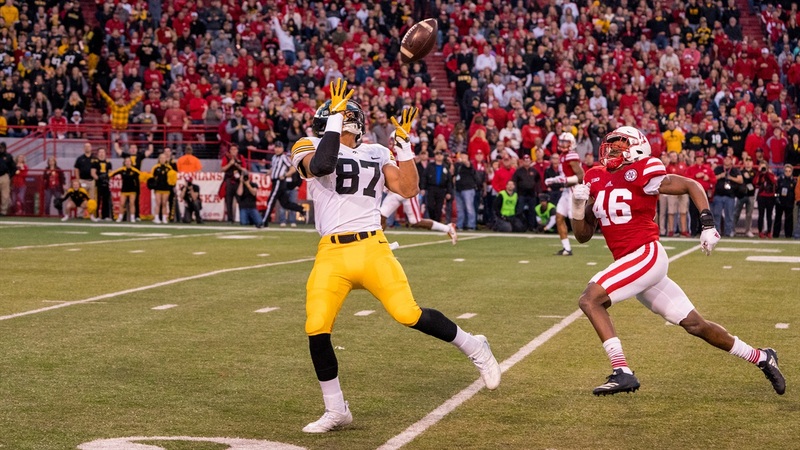 BV: The answer on offense is the most painful one for Husker fans: Iowa tight end Noah Fant. While I could also see adding a home-run hitter at running back –– hi, Adrian Killins Jr. –– the thought of the numbers Fant would put up this season is too much to ignore. But if I could grant just one wish for Nebraska football in 2018, it would still be a lockdown corner. Give me Georgia’s Deandre Baker. GS: This is a great question. On offense I’m going with a boring answer of Alabama starting center Ross Pierschbacher. Defensively, I think that Houston defensive lineman Ed Oliver is the best player in college football. Through two seasons he has 38.5 tackles for loss. That would be great to add to this defense that needs a true disruptive force. DP: Nebraska probably wins a Big Ten division crown right away if we pull McKenzie Milton out of Orlando and plug him into the quarterback spot, but since that’s probably not the best for roster-building purposes and everyone else has gone positional needs, I’ll say offensive lineman Dalton Risner from Kansas State. An All-Big 12 first team guy with tackle and center experience in an offense designed to grind teams down. Yes, please. Defensively, I want Greedy Williams from LSU. Best cover corner in the conference and he’s entering his sophomore season. Tied for the SEC lead in interceptions (six), led in passes broken up and allowed one score on 71 targets. JP: I’d definitely take Noah Fant if I had the choice, but for the sake of the exercise I’ll go with guys who haven’t been taken already. Give me Elgton Jenkins from Texas A&M who Walter Football currently has ranked as the top center prospect in the country for the 2019 NFL Draft. On defense, give me Ohio State edge rusher Nick Bosa, both because he’d dramatically upgrade Nebraska’s pass rush no matter where they lined him up and because the Huskers wouldn’t have to try to block him on Nov. 3. GS: I thought for sure that Harbaugh would be wildly successful at Michigan, having been to a college football playoff by now. The problem is that I thought to get there, Michigan State would take a step back and Penn State would plateau. Welp. Sparty has stayed pretty steady and James Franklin really has Penn State rolling. I haven’t even mentioned Ohio State which I don’t see Michigan beating consistently. I think he is there 3 more years before looking back to the NFL. BV: I guess I don’t view the NFL as inevitable for Harbaugh. He’s a strange guy and I think being at Michigan where he can continue to metamorphosize himself and that program into something from the 1950s has a unique appeal. Will it work? I’m less certain about that and for that reason I’m sort of obsessed with what happens in Ann Arbor. It’s delightfully tense (for those that get to watch from afar). What happens when a fanbase gets the guy it’s sure will deliver salvation and then he doesn’t? I’m not ready to say Harbaugh won’t –– last year’s record seemed perfectly reasonable given the context –– but we’ve had to at least ask the question after three seasons. (And, yes, there are potential Nebraska parallels here, too. Michigan just has a three-year head start.) As for Ferentz, I could see him being there for another decade. DP: The last part first, Ferentz has a pretty cushy gig; I could see him sticking around for a while there. As for Harbaugh, I think those kinds of acts can wear on programs and fanbases. Maybe not necessarily the players themselves but Harbaugh seems like the type that’s tough to work with. If I had to guess, I’d say he stays in the college ranks where he can have a little more control over things but he might end up being one of those guys that has to jump around from school to school here before too long. That is unless he wins something, of course, and if he’s going to win something in the Big Ten this is as good a year to do it as any. That defense is nasty still, he has a really, really good quarterback and Ohio State might be more vulnerable than years past. Disappoint again and things get tense, in my opinion. JP: Nebraska did a good job in 2018 of landing Millard West pitcher Colby Gomes, who might hear his name in this year’s draft (but likely not high enough to keep him from enrolling at Lincoln). Kyle Perry (Millard South) and Shay Schanaman (Grand Island) both have some MLB potential as well. It remains to be seen if Nebraska can keep this rolling into 2019 and 2020, but they’re off to a good start in trying to get local recruiting turned around. GS: It’s hard to go with anything other than quarterback based on the change on offense, Mike Riley’s ability to get his guys in fairly quickly plus Scott Frost being able to get his guys in right away. However, I’d call out the running backs since last season. Since Frost and company have gotten to Lincoln, they’ve added Greg Bell, Maurice Washington and WR/RB Miles Jones. They currently have Rahmir Johnson and Thomas Grayson committed in this class. The running back is back at NU. JP: There’s no doubt that the quarterback position was in a bad place towards the tail end of the Bo Pelini era and the beginning of the Mike Riley one. Look no further than the fact that Ryker Fyfe was the best option when Tommy Armstrong got hurt. It remains to be seen just how good Tristan Gebbia, Adrian Martinez, Noah Vedral and Luke McCaffrey will be at Nebraska, but there’s no doubt that Frost has done a good job of building up depth of talent in that room with guys that really fit what they want to do. DP: I want Adrian Martinez at quarterback. I want Hunter Miller at center. I want Miles Jones, Jaron Woodyard, JD Spielman, Tyjon Lindsey and Stanley Morgan Jr. as my skill position guys. I will put my offense against any other team in the country. On defense, I want Luke Gifford, Mohamed Barry, Breon Dixon, Dicaprio Bootle, Ethan Cox, Deontai Williams and JoJo Domann. It’s weird to think that simply removing line play results in me suddenly feeling really good about my chances against anyone. JP: Derek just went ahead and took who he wanted, so I guess we’re not doing a draft. That being said, I’ll try to mix my team up at least slightly from Derek’s. Give me Tristan Gebbia at QB and Michael Decker at center (I’ll convince him to come out of retirement for this since it’s no contact). My skill guys are Stanley Morgan Jr., JD Spielman, Tyjon Lindsey, Austin Allen, Mike Williams and Miles Jones (so I have a sub). On defense, I’ll take Dicaprio Bootle, Breon Dixon, Luke Gifford, Mo Barry, Cam Jones, Aaron Williams and yes, Lamar Jackson (you don’t have to tackle in 7-on-7!). I’ll take my team over Derek’s all day. GS: Last recruiting class and this one I believe the plan was to take 5 or 6 JUCO players to fill immediate needs and bolster depth where it was sorely needed. Generally that line of thinking is the balance a program is trying to achieve. However, I think Nebraska is in a unique position with this for a couple of reasons. 1) Ryan Held’s experience building JUCO programs and being a head coach at that level gives him a unique amount of experience which is why he is the JUCO recruiting coordinator at Nebraska in addition to the RB Coach. 2) Nebraska will likely never recruit consistently at a top 10 level because of the talent base in the state so it makes sense to supplement with 2-year players consistently. Many people think them taking 3-6 JUCO players a year is just a temporary thing. I disagree and think it makes sense to continue doing it. BV: The conventional view is that it’s something of a high-risk, high-reward strategy. Most players are at a junior college for a reason and it’s because something didn’t go exactly as planned the first time around. For some schools, depending upon what exactly went wrong, the risk isn’t worth it. But for a new staff at a new place it becomes a little easier to take on that risk as the coaches should have time to weather any mistakes or misses. The upside, of course, is the program gets a player who was often good enough to get a Power 5 offer out of high school and he has game experience. The wildcard with this staff is its confidence in evaluating players to fit their scheme and Held’s deep connections in that world. Both of those also serve to minimize the risk a little bit, so I think you’ll see consistent junior college recruiting but maybe not quite to the level we’re seeing right now. DP: Probably not smart of me to disagree with Greg on this kind of stuff but I will for the sake of argument. They’re high-risk, high-reward like Brandon said and you can absolutely have success with them (I think guys like Will Honas and Deontai Williams are in for big years) but I just don’t see this staff struggling enough to recruit the guys they want to where they need to load up on JUCO guys. This first year was different because while Frost knows he has the time he needs to build, I think he also knows he probably needs to put as good-looking a product on the field as he can. And the guys that have been added from the JUCO ranks are all in areas of need that Frost addressed when he first got to Lincoln. Moving forward I just don’t see them sustaining this volume of junior college guys because I think the staff would generally prefer more clean slates to teach and develop. BV: It hasn’t been filled to my knowledge, and I’m guessing football will have a majority say in that hire. I say that because every major college program needs a nutritionist to serve the entire athletic department, but this football staff seems intensely interested in it. I’m guessing the football staff wants something more than a one-size-fits-all person in charge, even if that person needs to serve all the programs. And other sports care about it, too. Volleyball definitely does and has for a long time, but they sort of helm their own program when it comes to nutrition. JP: That depends on how you frame the question. If you’re talking about pure talent coming out, Justin Patton is the easy answer. After he committed to Creighton, he blew up and became a consensus 4-star prospect. After a redshirt year, he went one-and-done at Creighton and was a top-20 pick in the 2017 NBA Draft (a bit of a surprise, but in talking with coaches when he committed, they never expected him to be there more than couple years). However, if we restrict it to just prospects when they were Hepburn’s age (he just finished up his freshman year at Bellevue West High School), we have to go a bit further back. The last player to get a high major offer at that age was Aguek Arop who Nebraska offered before his sophomore season, leading to his commitment to the Huskers. Arop was an athletic freak, but his freshman season at Omaha South doesn’t stack up to what Hepburn did this year and Arop didn’t quite develop after that point as much as Nebraska was hoping (thus, the split between the two sides). Looking even further back, the answer is probably Akoy Agau. Agau was a 4-star prospect who, unlike the late-developing Patton, was a monster from the first time he stepped on the court wearing an Omaha Central jersey. Agau ended up with close to 40 Division I offers by the end of his recruitment and he chose Louisville, which is pretty much unheard of for a kid from Nebraska.